Disclosure: I received a Daily's Prize Pack with gift card for this post. Any opinions are honest and my own but may vary from yours. Giveaway is in no way associated with Facebook, Twitter, Google, Pinterest or any other social media site. Summer is officially here and that means BBQ's, swimming at the pool or beach and enjoying the outdoors. If you're like me, you like to have family and friends over to just relax or have a meal. On hot days, I love to have a BBQ complete with yummy food and cocktails. What I don't like about the cocktails is having to pull out a blender, have ice and stand there mixing up everyone's drinks. Daily's Cocktails has easy frozen pouches that go into the freezer and once frozen, you can just open, pour into a glass and enjoy. The work is done for you. The alcohol is in the pouch! iPad with Retina Display Giveaway Ends 7/11! Disclosure: I received no compensation for this publication. My opinions are my own and may differ from those of your own. Just the Two of Us and Deals is not responsible for sponsor prize shipment. This event was organized by MomPoweredMedia please contact tina@babycostcutters.com with questions or to see your business or blog featured on the next big event! Giveaway is in no way associated with Facebook, Twitter, Google, Pinterest or any other social media site. Want to win an iPad? Enter to win an iPad with Retina display below! Do you live overseas and enjoy shopping in the Unites States? Do you run your own eCommerce site and need to ship to international customers? Do you have loved ones overseas and wish to send gifts to them as safely and inexpensively as possible? If you answered yes to any of these questions then Parcelbound.com is for you!! Watch this video below and find out how. Man Cave Giveaway - Win a 46" HDTV, Foosball Table and Kegorator! Ends 7/5! Disclosure: I received no compensation for this publication. My opinions are my own and may differ from those of your own. Just the Two of Us and Deals is not responsible for sponsor prize shipment. Please contact teri@mompoweredmedia.com with questions or to see your business or blog featured on the next big event! Giveaway is in no way associated with Facebook, Twitter, Google, Pinterest or any other social media site. Man Cave Giveaway EventOrganized by: Mom to Bed by 8 What a fabulous giveaway for that special man in your life...or even for yourself, I won't tell! :) Enter below to win a HDTV, Foosball Table and Kegorator! $50 Target eGift Card Giveaway - 2 Winners, Ends 6/25! GiftCardRescue is your place for discounted gift cards! You can purchase discounted gift cards up to 30% off and get free shipping! Plus, they offer 100% money back guarantee!! Why would you not purchase your gift cards from GiftCardRescue?! Do you love shopping at Target? How about shopping for FREE at Target? Enter to win a $50 Target Gift Card! 2 people will win! 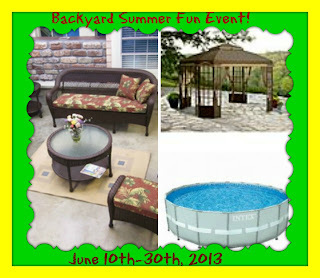 Backyard Summer Fun Giveaway Event! Just the Two of Us and Deals is not responsible for shipment of prizes. No purchase necessary to enter! No compensation was received for this post and giveaway is in no way associated with Facebook, Twitter, Google, Pinterest or any other social media site. What a great giveaway event! You could win one of four prizes - a pool, a gazebo, a patio set or a visa gift card! What are you waiting for? Enter! $100 Visa Gift Card Giveaway Ends 6/24! Need an extra $100? Enter to win a $100 Visa Gift Card! Disclosure: By entering this giveaway you agree to receive email communications from Melissa & Doug. I received no compensation for this publication. My opinions are my own and may differ from those of your own. Just the Two of Us and Deals is not responsible for prize shipment. This event was organized by MomPoweredMedia please contact tina@babycostcutters.com with questions or to see your business or blog featured on the next big event! Giveaway is in no way associated with Facebook, Twitter, Google, Pinterest or any other social media site. SANUS Flat Panel TV Wall Mount Giveaway Ends 6/20! Disclosure: I received no product or compensation for this post/to host this giveaway. Giveaway is in no way associated with Facebook, Twitter, Google, Pinterest or any other social media site. Flat panel TV's are amazing. They offer fabulous picture quality and thin designs that make them able to be put just about anywhere in your home. However, did you know that they are potential hazards for children? Along with their sleek designs, flat panel TV's come with the ease of knocking them over with just an accidental bump, which could cause injuries or even death in children. SANUS, the leading designer and manufacturer of flat panel TV wall mounts, has partnered with Safe Kids Worldwide. By educating consumers about the risk of unsecured flat panel TV's, SANUS and Safe Kid Worldwide offer safe solutions for families by reducing TV tip-over related injuries and fatalities. Greentoe's Canon Rebel T3i DSLR Camera Giveaway Ends 6/30! Disclosure: Just the Two of Us and Deals was not compensated for posting this giveaway and is not responsible for prize fulfillment. Giveaway is in no way associated with Facebook, Twitter, Google, Pinterest or any other social media site. Have you always wanted an amazing camera? Nothing beats a Canon Rebel camera so enter to win one below! 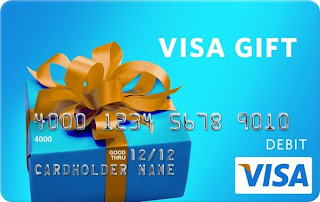 $200 Visa Gift Card Giveaway Ends 6/28! Disclosure: Just the Two of Us and Deals is not responsible for prize and was not compensated for this post. If you have any questions about this giveaway please send an email to nysavingspecials@gmail.com. All entries are optional, if you do any of the tasks you can collect the entries, even if you do one entry you can get the extra 1 entries but if the winner tasks is a tasks you did not complete, a second winner will be chosen. If the winner tasks is the one you did you will be the winner. Giveaway is in no way associated with Facebook, Twitter, Google, Pinterest or any other social media site. Need an extra $200 for a summer trip? or maybe to treat yourself to something nice? or maybe even help with some bills? Enter to win a $200 Visa GC below!